Going to/from full screen mode will modify the visual artifact. These sort of things are usually Qt + your graphics driver's fault. it happens both for mixxx 1.7.x and latest trunk. After changin theme both waveform displays appear, but dropping songs on the waveforms does not work. Happens here, with freshly upgraded ubuntu (Lucid). Happens to me, Ubuntu Lucid, i915 graphics driver. Committed a workaround in r2381 of trunk. I just added a rebootMixxxView(); call at the bottom of MixxxApp's constructor. There is still increased CPU usage on Qt 4.6 though, so someone smarter than me should still take a look at this. Albert: Does changing the skin solve your issue too? Can you also try building with Qt 4.5 and see if your problem goes away? I think we have two distinct problems here. One which is caused by something in Qt 4.6 (vs 4.5) that is "fixed" by the way rebootMixxxView() works (which seems to be what most of the complaints are here,) and another that may be video driver-related. For the first problem, perhaps we need to review how we're setting up the GUI against Qt best practices...might we be doing something incorrectly? I think you have merely unlinked/deleted the image which corresponds to the UV map. Solution: TAB into editmode, select (A)ll, and in the image window, create a new image with resolution you wish, like 64x64. I attach the file where i did this, with bakemap packed in. It's smaller because i used internal compression. > building with Qt 4.5 and see if your problem goes away? > Qt best practices...might we be doing something incorrectly? > Going to/from full screen mode will modify the visual artifact. This affects me on a fresh install of 64-bit Ubuntu 10.04 running mostly defaults. I'm using the latest Nvidia drivers. Let me know if you need any more info (I don't know what's relevant). me for a while, so Qt 4.5 probably doesn't solve it for me either. from the sources of mixxx 1.7.2 (got with an apt-get source, apt-get build-deb and scons did the job of resolving the dependencies and compiling for me) and everything works fine. (proprietary NVIDIA driver installed and in use). The problem appeared while upgrading from Karmik to Lucid and now disappeared. I added the workaround (along with a version check) in the 1.7 branch r2567. Version check merged to trunk in r2409. If you have Qt 4.6.0 or later, the extra rebootMixxxView() is called. If you have a version of Qt older than that, it isn't. I just built mixxx-1.7.2 with the workaround from r2567 on Gentoo x86. Both waveform displays appear after startup - BUT: dropping songs on the waveforms does not work. (and I'm used to load songs this way) Exactly the same happens without the patch after changing the theme. > I just built mixxx-1.7.2 with the workaround from r2567 on Gentoo x86. > the same happens without the patch after changing the theme. I confirm Robelix's segnalation: dropping songs on the waveforms does not work on lucid with patched mixxx. Tried to apply http://bazaar.launchpad.net/~mixxxdevelopers/mixxx/trunk/revision/2406 to 1.7.2 - this just gives an error at startup - it fails to disconnect a signal. 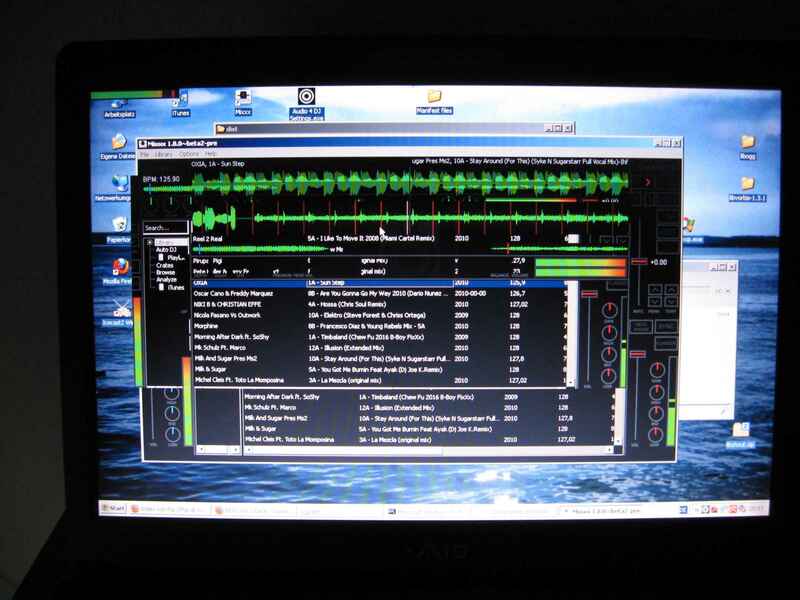 Then mixxx works, but without drag-n-drop. At the moment I'm trying 1.8 rev. 2421 - The waveform and d'n'd issues are solved in this rev. Still testing if there is other foo that keeps me from using this, but so far it looks good. QT 4.6.3 has been released a couple of days ago. Now, we get visual corruptions even on Windows, see attachment. The core developers might want to add additional information just for clarity. FYI the bug Tobias reported to QT was closed as duplicate. Awesome, the QT guys are fast. I'll try to checkout QT 4.6.4 trunk and give it a shot. Yeah, Player 1 used to not show up until I rebooted the skin, in 1.7.2, or deleted mixxx.cfg before loading up. Cool, I'm marking this fixed in the 1.8 series then. 1.7 doesn't have the workaround I don't think. Bug still present in 1.8-bzr r2567 with mixxx.cpp workaround disabled. Marking confirmed. No bug was filed against the package for Debian. Fixed in trunk r2512. For whatever reason, if you make your QFrame, call MixxxApp::setCentralWidget on it, then add your (pixmap-filled) qlabel as a background and then your two qglwidget waveforms, the first waveform gets all corrupted (at least, I think that was the final diagnosis). The solution (hack) is to call setCentralWidget after all the widgets are created, in both the initial skin loading and the reboot method for skin changing. This should probably go upstream to Qt, it looks like it's not dependent on graphics drivers, as was my original suspicion (at least on linux). I commented out the rebootMixxxView hack with instructions to myself to remove it if this fix works for everyone. Many thanks to RJ. FYI the original rebootMixxxView hack is still sufficient for users of pre-1.9, the setCentralWidget changes only became necessary after the merging of uglyduckling into trunk. Is it possible to add full Open GL acceleration instead of rendering in QT? I suppose every bug related to waveforms will be fixed once and forever. The waveforms are rendered using QtOpenGL so, assuming Qt is working correctly, the waveforms are OpenGL accelerated.